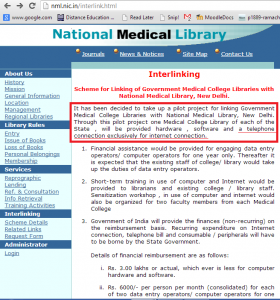 The National Medical Library in New Delhi has its website at www.nml.nic.in. Our Philosophy : Excellence. At NML, we are driven by a singular focus on medicine. And our dedication to the medical community follows suit. Which is why we have earned the distinction of being one of the leading resource of medical information in Asia. The National Medical Library aims to provide wide and efficient library and information services to the health science (HS) professionals in India. It functions under the administrative control of the Directorate General of Health Services. There is a reference to interlinking of libraries and a mention of hardware, software and….a telephone connection exclusively for internet connection!! Telephone line?? For internet access? Can they not afford more for libraries? And are libraries expected to provide “Excellent Services” with outdated technology? Libraries have the minimum of Broadband Internet Access? Librarians are constantly trained to help users access and use resources? This will happen if all those of you who want such services, get together and do something about it. QMed is prepared to guide and lead. Of course there will be problems and issues. But can we get started and go over obstacles, treating them as “Stepping Stones” ? This entry was posted in 1 - VS Shares and tagged QMed's Challenges. Bookmark the permalink.